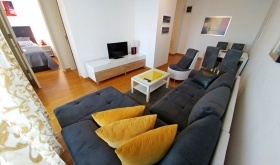 Rentastan (translated as rent-a-flat) is one of Belgrade's oldest short term rentals agencies. We boast a professional service and a dedicated team! One of the Best Short Stay options in Belgrade! When it comes to accommodation in Belgrade - we offer value for money. Make your stay a memorable one. 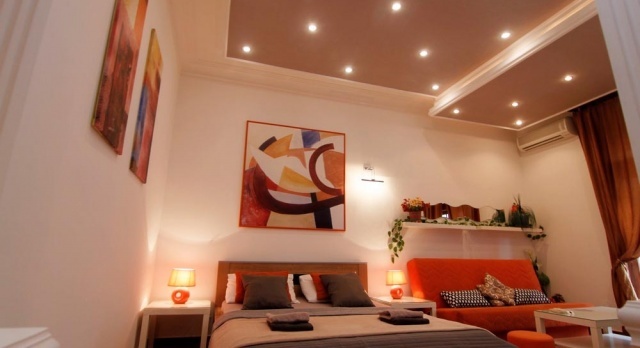 ORANGE is a standard short term rental in Belville, New Belgrade. It accommodates four people, and has its own parking spot that is included in daily rental price. GLORIA is an excellent short term rent apartment in Belvile residential complex in New Belgrade, that can accommodate up to four people. It's one of the four identical apartments in our offer, which are very close to each other, so they can be combined for group visits. Guests have a parking spot at their disposal. The smallest and by far the most affordable apartment in our offer is located in New Belgrade in the same building where apartments GALA, ATOS and ETNA are. It is an ideal choice for singles or couples who search for a decent accommodation in Belgrade in the proximity of Kombank arena in New Belgrade. Wi-fi Internet, a snug little cafe on the ground floor, several prestigious pizzerias in the neighbourhood, and plenty of parking space - all there to welcome You to the ARENA apartment. 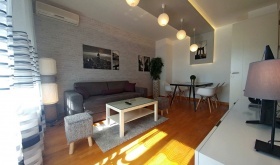 NINE is an excellent, brand new serviced apartment in Belville, New Belgrade. A bedroom, a lovely balcony with a wicker set, dedicated parking spot, contemporary interior, a great residential complex with an abundance of facilities and a brilliant connection to the city – all of that pretty much summarizes NINE’s most important features. Halfway from Railway station to Terazije on the slope of Balkanska street, is the home to our apartment Belgrade. Belgrade studio apartment is the epitome of cosy accommodation for two adults in Belgrade.You will be within walking distance of Knez mihailova, very close vicinity of the Railway station and spitting distance of Terazije square. If you want to be in the center of Belgradeâ€™s events, your short term renting choice should be Belgrade Apartment. TENNER is a brand new, appealing one bedroom apartment in Belvile with own parking spot and enough room to accommodate four people. The proximity of NINER makes it suitable for groups of up to eight people. 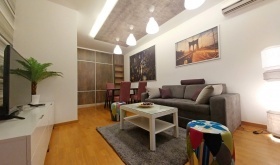 ORION is a fully refurbished, extremely neat and well equipped one bedroom apartment, very close to KOMBANK Arena. It is an ideal abode for up to 3 adults. Well adjusted for groups, as ATHOS, GALA, ETNA and ARENA are within the same apartment building. A shop is literally on the ground floor of the tenement and a number of renown pizza parlours are in its immediate neighbourhood. Theater apartment is located in the heart of Belgrade, next to the National Theater Building, and about 100m away from both the Republic Square and Knez Mihailova street. If you open the windows of the Theater Apartment in the summer, soothing sounds of live piano music coming from the "Writer's Club" will fill the room. Palace apartment in Kosancicev Venac street, is one of the few remaining places where the spirit of nineteenth century Belgrade roams on the cobblestone. A beautiful, bright studio apartment, furnished with taste and functionality, PALACE is reason enough for a visit to Belgrade. Absolutely perfect for couples. A small, modern studio apartment in the vicinity of Belgrade Arena, ideal for singles or couples and fairly adequate for three persons - this, in short, is the description of our ATOS apartment in New Belgrade. Facing the building's atrium, the apartment is very quiet and rich with natural light. Its convenient location, AC, central heating system and the WI-FI connection make ATOS a benchmark of an excellent serviced apartment accommodation in Belgrade for businesspeople and tourists alike. In a brand new apartment complex in New Belgrade, not far from Belville, and just next to A Block is a cozy spot of our apartment EXOTIC. The apartment is the embodiment of well pacled space and fine quality accommodation in Belgrade .guests also get a parking spot at their disposal, that is included in daily rental price. 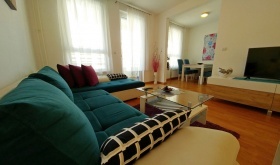 OASIS Apartment in New Belgrade was built for the purpose of short term lease. Based in the most beautiful part of New Belgrade, it represents more than just a good lodging for three adults. Zemun Wharf with some of the most famous club barges is a mere 200m away from the flat, and a high frequency public transport line (No 16) to the city center is in front of the building. ETNA is a charming little one bedroom apartment in New Belgrade, located in the same apartment building where GALA ATHOS and ARENA apartments are. Its fully utilized 34 square meters provide a pleasant accommodation for up to four people. 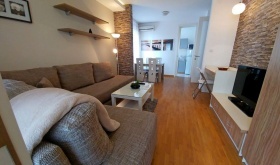 With a shop on the ground floor, a couple of good restaurants in the neighbourhood, KOMBANK (Belgrade) Arena across the road and a 10 minutes walk from Delta City, ETNA apartment is a great option of short term rental in Belgrade for all occasions. SKIPPER is an excellent one bedroom apartment for up to four people who are looking for a place to stay in New Belgrade's finest residential complex - the wonderful Belville. Apart from its pleasant interior, SKIPPER also boasts an interesting, 10th floor view over the roof-tops of New Belgrade. Our apartment MOSCOW is located in the center of Belgrade, in a gorgeous part of Vracar, better known as Cubura. 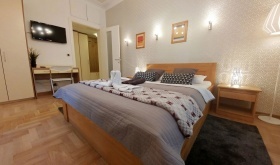 It is situated at the end of the street, five minutes walk from Slavija Square. Together with a place in parking garage, a separate bedroom and lovely surroundings, MOSCOW apartment is a very good accommodation in Belgrade for four adults. Conceptualized by a prominent Belgradian interior designer, equipped with good taste and agreeable atmosphere, DELUXE apartment Belgrade is situated in Majke Jevrosime street just behind the National Assembly Building (House of Parliament). With an array of details that live up to its name, DELUXE is an ideal abode for those who leave nothing to chance. DELUXE is truly luxurious in a range of its characteristics from its central location to the abundance of design details. In one of the most romantic streets in Belgrade, in the very center of the city, and at the very spot that inspired many a painter to eternalize the sight of the left bank of Sava river and Belgrade's bridges, is our apartment PRAGUE. Surrounded by memories and the tumultuous history of Belgrade, Prague is the best place to experience Belgrade to the fullest extent. You would like a state-of-the-art apartment in New Belgrade, with a garage, a separate bedroom and a terrace? The wonderful Belville residential complex, some six kilometres away from the center, is a home to our Mimosa apartment which is a perfect rental choice for four adults. 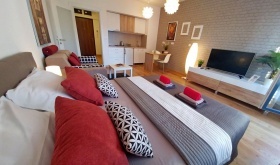 With a large shopping mall (Delta City) which is part of the complex, proximity of the Sava Wharf and a modern surrounding area, Mimosa is the right choice for anyone who is looking for a luxury short term rental apartment. CAPTAIN is an apartment curled up in a quiet street in Dorchol on the fifth floor of an apartment bulding dating back to 2012. Although tiny, CAPTAIN has a separate bedroom, which , combined with a foldable twoseater in the living room. allows for an accommodation of up to four adults. It also features a lovely terrace with and even lovelier view over Dorchol. A parking spot in the apartment building’s garage is available at a 5 euros per day rate. 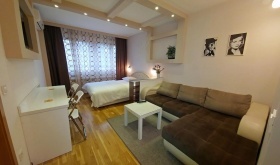 TZAR apartment is snuggled in beautiful one way street in the very center of Belgrade. The fifth floor apartment windows give you a stunning view on Kalemegdan park. Staying in TZAR apartment means to be two minutes away from Kalemegdan, four minutes away from Knez Mihailova Street, six minutes away from Republic Square and eight minutes away from Skadarlija (on foot, of course). KOLARAC is an apartment situated in a small block of buildings, at the very Republic Square in the Ccentar of Belgrade. It has a separate small bedroom with a an equally small "single" bed which makes it a comfy abode for up to three people (out of which one should preferably be not a very a tall child). Locationwise, KOLARATZ is an apartment with only a few competitors. You can't find a free apartment? Vacation rentals chosen for you! Apartments in Belgrade is what we specialize in. RENTASTAN agency (literally meaning rent-a-flat) was founded in May 2006 with the aim of providing, until then, a very underutilized form of accommodation to visitors of Belgrade short term rentals or vacation rentals. This form of accommodation is considerably more affordable and comfortable option to hotels. Moreover, it is far more practical in terms of privacy as your guests do not have to leave their personal details with the receptionist. Our offer includes Belgrade apartments located in the center, the wider city center area, as well as New Belgrade. All have been chosen to serve the particular needs of our clients. All our Belgrade Apartments have the functionality of hotel accommodation - you get your own sheets and towels, cable TV, Wi-FI, and an air conditioning unit. in addition, each apartment has its own kitchen and the full functionality of a home. A very competitive price, full discretion and amenities of a home that you obtain by renting accommodation with RENTASTAN makes us much more favourable to staying in a hotel. It goes without saying, that a bulk of our first time visitors, return visits and recommend us to others. Welcome to RENTASTAN serviced apartments in Belgrade !